Since RWU was founded in 2008, we have made use of a number of cartoons to get our point across. In fact, even before RWU was formally organized, the group ROCU (Railroad Operating Crafts United) made use of cartoons to lampoon the fight between the operating crafts and address the question of the need for unity. Many of our cartoons have been custom drawn exclusively for RWU by the nation's premier labor cartoonist Mike Konopacki. This was the path that the unions of the operating crafts were taking when ROCU was organized in 2005-2006. Another cartoon ROCU used to draw attention to the counterproductive divisiveness between the unions of the operating crafts. In 2008 RWU conducted our Founding Convention. Mike Konopacki worked with our new Steering Committee to create our logo. 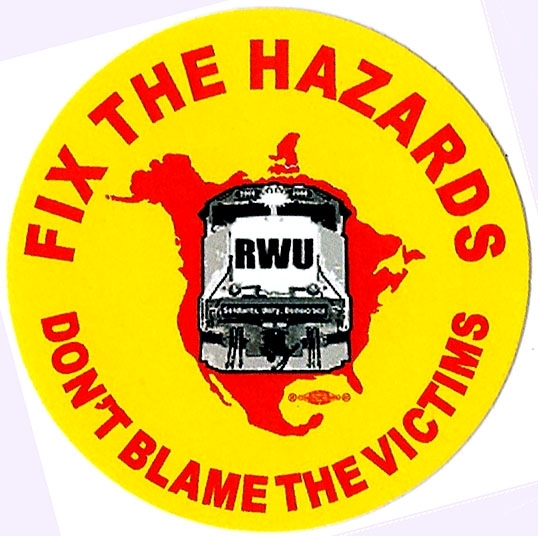 RWU mounted and all-out effort to defeat the BNSF TA that would have allowed for single employee train crews in 2014. With the assistance of Mike Konopacki once again, were parodied the SMART union and its TA with the BNSF that would have allowed for single employee train crews. Mike hit the nail on the head with this cartoon showing the greed and proft mongering behind the drive for reduced train crew size in train operations. RWU stands squarely opposed to “Precision Scheduled Railroading” as a scourge to railroad employment, safety, and efficiency. We challenge the rail unions to get on board and likewise issue statements in opposition to this dangerous trend in railroading.